On Tuesday, Lansdale won 4-2 against Archbishop Wood. Lansdale won again on Friday, 3-0 against Carroll, to preserve a perfect record on the season. They still have to face, in their final three games, St. Joes, La Salle, and Judge. On Tuesday Roman Catholic found a winner against La Salle when a free-kick rebounded to the kicker, whose second effort took a deflection and went in, ending the double overtime. For Roman, this is the first time beating La Salle. St. Joes undefeated run ended in their match against Judge on Friday. Father Judge’s Danny Fuopizio went on to make four saves. Up front, the Judge team found three goals, one each from Geoff Degnan, Abrahem Krema, and Joey Hansen. With the win, Judge improves to 6-0 in the league. After a three game slip, La Salle returned to winning on Friday, beating Ryan 3-1. The table below shows the current records. In a match of two undefeated teams, Northeast stomped on Prep Charter 5-0. With the win, NE separates itself from the rest of the league as the team to beat. PAC beat Masterman 7-0 on Monday, but lost to Bartram 4-3 in double overtime this Friday. This is a big success for Bartram, who were middling before. Now they will believe they can play for it all. On Monday Central defeated Fels 7-0, and on Friday beat South Philly 2-1, finding two goals in the last ten minutes to win. This allowed Central to leapfrog South in the standings. Standings as of Sept. 29 below. A big shout out to Lower Merion Lightning U17 players who are killing it for Father Judge! 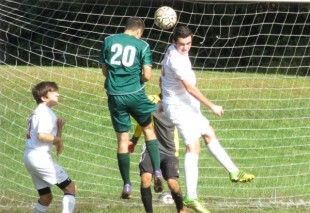 The photo is of Christian Toeller scoring the game winner for Lansdale against Carroll.